STOCK# - BADR1019 MFG# - 175-7 New and unused. This ships FREE within the U. This is the Crescendo Model 175 Airbrush from Badger. Dual action internal mix siphon (bottom) feed. 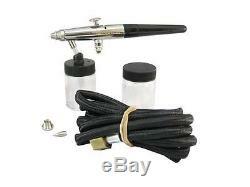 Durable versatile airbrush works continuously with precision and efficiency. Spray regulators and tips change easily for greater flexibility on the fly. Snap-off handle allows for quick needle changes and cleaning. Sprays properly reduced acrylics enamels lacquers gouaches fabric colors inks dyes ceramic colors and glazes watercolors Air- Opaque Air-Tex and MODELflex airbrush colors. Self-lubricating needle bearing enables continuous proper paint flow and prevents needle wear. Winged back lever design for easy reassembly and smooth trigger control. One-piece non-slip trigger with ergo-comfort trigger cushion. One Crescendo Model 175 Airbrush Fine Nozzle/Needle: Spray width from pencil line to 2 (51mm) Medium Nozzle/Needle: Spray width from 1/32 (0.8mm) to 2-1/2 (63mm) Jar with Jar Adapter Braided Air Hose with Varying Air Source Fitting One 1/4oz (7ml) Color Cup Protective Cap Instruction Sheet. Air Regulated Compressor -or- Propellant (BADR1150/1160). PSI: 20 to 50 lbs. Power requirements: at least 1/12 horsepower compressor. Sdw 9/24/01 ir/kh updt jxs 06/19/14. Products similar to this one. Badger 155 Anthem Airbrush Deluxe Set. International Buyers Only - Please allow 2 to 4 weeks for international deliveries. The item "NEW Badger 175 Crescendo Pro Airbrush Set 175-7 NIB" is in sale since Friday, October 10, 2014. This item is in the category "Crafts\Art Supplies\Airbrushing". The seller is "omnimodels" and is located in Champaign, Illinois. This item can be shipped worldwide.